Heat a griddle and place the onions, garlic and hot pepper with a drizzle of olive oil. Let the onions become golden. Add the basil and let it crisp a little. In a large frying pan heat a drizzle of olive oil and place the beans. Add the onions, garlic, basil and hot pepper. Add the tomatoes and let simmer. 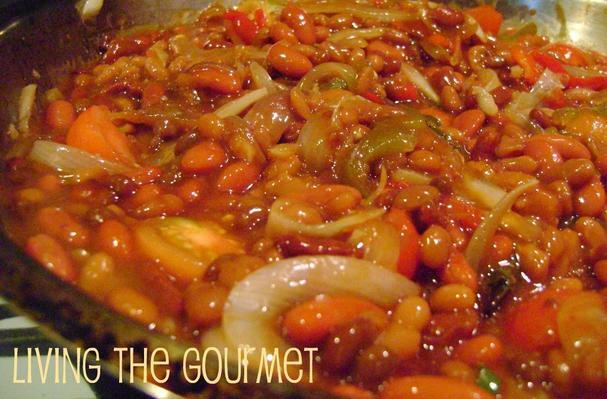 Prepare the sauce and add to the beans and let simmer for a few minutes. That is exactly what I said when I tasted them! This recipe so simple and a get way to “kick” up your bean dish!